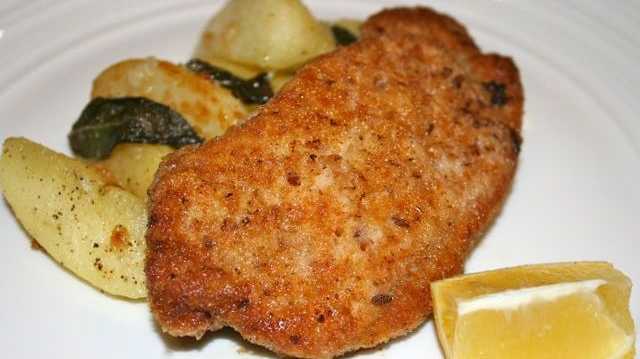 Surfing around for something different to do with pork loins I stumbled across a tasty crumbed pork recipe to be served with sautéed apple, potato and sage -sounds scrumptious doesn't it? Is it the crumb that makes it so inviting do you think? It certainly pulled me in. The recipe called for fresh breadcrumbs and to be honest, I'm usually a bit lazy when it comes to making breadcrumbs. However, on this this occasion I made an exception using some left over spelt baguette which I processed in the blender. Then it was just the simple step of lightly toasting in the oven. For a 5 minute job the results were very rewarding. The crunch and taste was so much better than that of stale cupboard breadcrumbs, so please take the extra time to make your own too - it's stress-free and you'll love me for it. My homemade breadcrumbs crisped up beautifully and then when my palette hit the juicy pork, well let's just say there couldn't be a better combination of flavours! This coupled with the sautéed apple, potato and sage made this dish a wee bit fancy. Purchase a free range pork variety if you can, or better still, if you can get your hands on a Bangalow Pork cutlet this will take your dish to food heaven. You'll notice there's quite a lot of butter in this recipe, and if you're anything like me I always try to be conscious of healthy eating. But you know what else I think? I think that a one off dish here and there isn't going to kill me, so I say go for it - I love butter and the more the better! Place the flour on a flat plate and season with some sea salt. Whisk the milk and egg together in a bowl. Place the breadcrumbs on a separate flat plate. Dip the pork loins in the seasoned flour and shake away any excess flour, then dip into the combined milk and egg. Finish by dipping the loins into the breadcrumbs, ensuring the meat is evenly coated. Shake away any excess breadcrumbs. Heat half the oil and butter in a frying pan. When the butter is foaming, add two pork loins and cook over medium heat until the breadcrumbs are golden. Turn and cook the other side until golden and the pork is just cooked. Place in a warm oven and repeat the process with the remaining two pork loin medallions. Heat a pan over medium heat, and sauté the apple, potato, garlic and sage leaves in the oil and butter. When the butter is nut brown, add the wine and cook for 2 minutes, then add the stock and cook for a further 2 minutes. Add the extra butter to the pan, remove from the heat and swirl to incorporate. Season with sea salt and freshly ground pepper. Place a pork loin on each plate, some sautéed potato and apples next to it and serve with a wedge of lemon.